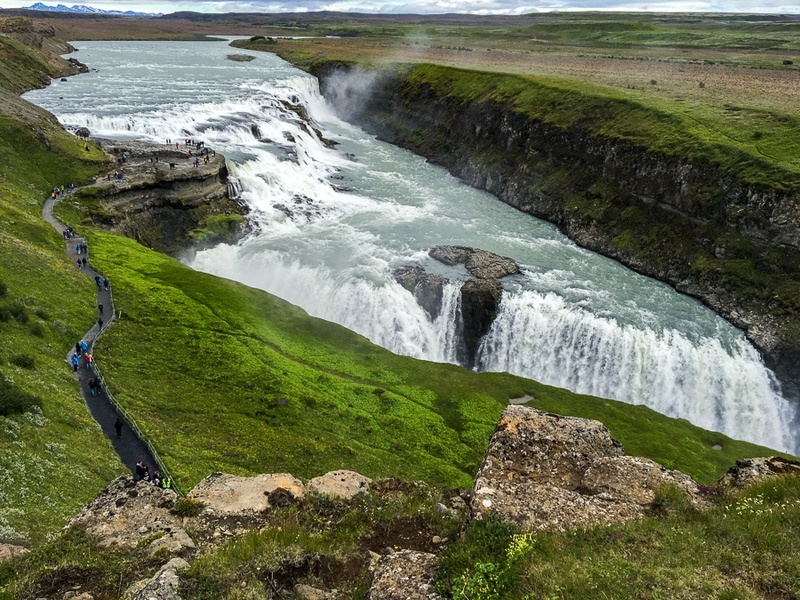 Gullfoss waterfall is part of the Golden Circle, one of the most popular tourist routes in the country of Iceland. The name also means ‘golden falls’. This is a big waterfall that goes down in two steps and has a bunch of different viewpoints. It’s only a 1.5 hour drive from Reykjavik, so that’s partly why it’s one of the most famous falls in the country. Gullfoss is probably not my favorite waterfall in Iceland, partly because of the crowds, but the fact that it’s easier to get to this one makes it more appealing. It’s definitely worth a visit if you have time! Gullfoss is located 75 miles (120 km) from Reykjavik, and the drive takes about 2 hours. You can drive here with a rental car, or there are prepackaged day tours that include the waterfall as part of their itinerary. From the Gullfoss parking area, it’s a short 10-15 minute walk down to the falls. No parking or entry fee is required.